I’m going to be honest, lasagne for me is tricky as a midweek meal when I make it with mince and veggies and sauces and fresh pasta, but it’s such a kid favourite! So I’m glad to cheat with this recipe, as the kids love it and it means one of their favourite meals can be on the menu a bit more often. The addition of the chicken and broccoli is a good way to change up a family favourite too. 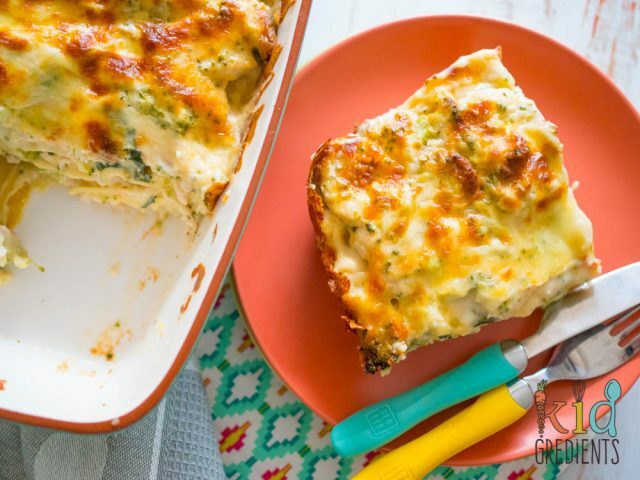 Heinz Four Cheese Lasagne Bake is perfect for this recipe. The thick and rich sauce adds so much flavour to this dish. Broccoli is meant to be drenched in a cheesy sauce, particularly in winter! It adds so much flavour to this highly underrated veggie – one of my kids’ favourite veggies – add the thinly sliced chicken to it and they are in heaven. But what if your kids don’t love broccoli? Well cauliflower can be substituted in exactly the same way or even try a combo of peas and corn. This recipe is perfect for asparagus in the warmer months when it’s in season. We’ve been having lots of fun with the new Heinz range of pasta sauces, and also made this yummy special veal parmigiana…It’s a one pot mid week winner! I have been making it on regular rotation.